Nakahara, J., Takechi, K., Myouga, F., Moriyama, Y., Sato, H., Takio, S. and Takano, H. (2015). Bending of protonema cells in a plastid glycolate/glycerate transporter knockout line of Physcomitrella patens. PLoS One 10(3): e0118804. Myouga, F., Akiyama, K., Tomonaga, Y., Kato, A., Sato, Y., Kobayashi, M., Nagata, N., Sakurai, T. and Shinozaki, K. (2013). The Chloroplast Function Database II: a comprehensive collection of homozygous mutants and their phenotypic/genotypic traits for nuclear-encoded chloroplast proteins. Plant Cell Physiol 54(2): e2. Yamaguchi, M., Takechi, K., Myouga, F., Imura, S., Sato, H., Takio, S., Shinozaki, K. and Takano, H. (2012). Loss of the plastid envelope protein AtLrgB causes spontaneous chlorotic cell death in Arabidopsis thaliana. Plant Cell Physiol 53(1): 125-134. Peng, L., Fukao, Y., Myouga, F., Motohashi, R., Shinozaki, K. and Shikanai, T. (2011). A chaperonin subunit with unique structures is essential for folding of a specific substrate. PLoS Biol 9(4): e1001040. Bryant, N., Lloyd, J., Sweeney, C., Myouga, F. and Meinke, D. (2011). Identification of nuclear genes encoding chloroplast-localized proteins required for embryo development in Arabidopsis. Plant Physiol 155(4): 1678-1689..
Tanaka, R., Rothbart, M., Oka, S., Takabayashi, A., Takahashi, K., Shibata, M., Myouga, F., Motohashi, R., Shinozaki, K., Grimm, B. and Tanaka, A. (2010). LIL3, a light-harvesting-like protein, plays an essential role in chlorophyll and tocopherol biosynthesis. Proc Natl Acad Sci U S A 107(38): 16721-16725. Myouga, F., Akiyama, K., Motohashi, R., Kuromori, T., Ito, T., Iizumi, H., Ryusui, R., Sakurai, T. and Shinozaki, K. (2010). The Chloroplast Function Database: a large-scale collection of Arabidopsis Ds/Spm- or T-DNA-tagged homozygous lines for nuclear-encoded chloroplast proteins, and their systematic phenotype analysis. Plant J 61(3): 529-542. Hanada, K., Kuromori, T., Myouga, F., Toyoda, T. and Shinozaki, K. (2009). Increased expression and protein divergence in duplicate genes is associated with morphological diversification. PLoS Genet 5(12): e1000781. Hanada, K., Kuromori, T., Myouga, F., Toyoda, T., Li, W. H. and Shinozaki, K. (2009). Evolutionary persistence of functional compensation by duplicate genes in Arabidopsis. Genome Biol Evol 1: 409-414. Okuda, K., Hammani, K., Tanz, S. K., Peng, L., Fukao, Y., Myouga, F., Motohashi, R., Shinozaki, K., Small, I. and Shikanai, T. (2010). The pentatricopeptide repeat protein OTP82 is required for RNA editing of plastid ndhB and ndhG transcripts. Plant J 61(2): 339-349. Umezawa, T., Sugiyama, N., Mizoguchi, M., Hayashi, S., Myouga, F., Yamaguchi-Shinozaki, K., Ishihama, Y., Hirayama, T. and Shinozaki, K. (2009). Type 2C protein phosphatases directly regulate abscisic acid-activated protein kinases in Arabidopsis. Proc Natl Acad Sci U S A 106(41): 17588-17593. Okuda, K., Chateigner-Boutin, A. L., Nakamura, T., Delannoy, E., Sugita, M., Myouga, F., Motohashi, R., Shinozaki, K., Small, I. and Shikanai, T. (2009). Pentatricopeptide repeat proteins with the DYW motif have distinct molecular functions in RNA editing and RNA cleavage in Arabidopsis chloroplasts. Plant Cell 21(1): 146-156. Myouga, F., Hosoda, C., Umezawa, T., Iizumi, H., Kuromori, T., Motohashi, R., Shono, Y., Nagata, N., Ikeuchi, M. and Shinozaki, K. (2008). A heterocomplex of iron superoxide dismutases defends chloroplast nucleoids against oxidative stress and is essential for chloroplast development in Arabidopsis. Plant Cell 20(11): 3148-3162. Shimizu, H., Peng, L., Myouga, F., Motohashi, R., Shinozaki, K. and Shikanai, T. (2008). CRR23/NdhL is a subunit of the chloroplast NAD(P)H dehydrogenase complex in Arabidopsis. Plant Cell Physiol 49(5): 835-842. Garcia, M., Myouga, F., Takechi, K., Sato, H., Nabeshima, K., Nagata, N., Takio, S., Shinozaki, K. and Takano, H. (2008). 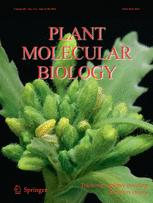 An Arabidopsis homolog of the bacterial peptidoglycan synthesis enzyme MurE has an essential role in chloroplast development. Plant J 53(6): 924-934. Okuda, K., Myouga, F., Motohashi, R., Shinozaki, K. and Shikanai, T. (2007). Conserved domain structure of pentatricopeptide repeat proteins involved in chloroplast RNA editing. Proc Natl Acad Sci U S A 104(19): 8178-8183. Motohashi, R., Yamazaki, T., Myouga, F., Ito, T., Ito, K., Satou, M., Kobayashi, M., Nagata, N., Yoshida, S., Nagashima, A., Tanaka, K., Takahashi, S. and Shinozaki, K. (2007). Chloroplast ribosome release factor 1 (AtcpRF1) is essential for chloroplast development. Plant Mol Biol 64(5): 481-497. Myouga, F., Motohashi, R., Kuromori, T., Nagata, N. and Shinozaki, K. (2006). An Arabidopsis chloroplast-targeted Hsp101 homologue, APG6, has an essential role in chloroplast development as well as heat-stress response. Plant J 48(2): 249-260.